Funnily enough, this works best if you have the Amiga version of Cannon Fodder lying around. If you haven’t come across it already, Openfodder is basically what it says on the box: an open-source port of Sensible Software’s very good Cannon Fodder. 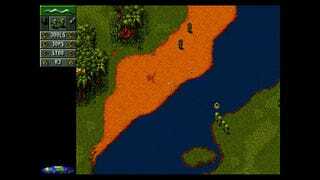 And given that top-down shooters and twin-stick games work very well on the Switch, someone thought Cannon Fodder would make for a good port as well. So that’s what keeganator did, releasing a Switch port of OpenFodder on Github. You’ll need the original Cannon Fodder files, either from the original DOS version (which you can get through GOG) or the Amiga versions. It’s worth noting that, obviously, this isn’t something you can download from the Nintendo eShop. You’ll need to use a homebrew launcher, so chances are this isn’t an option for anyone who’s kept their Switch patched throughout. If you’re one of the few people who is still running older Switch firmware, then you can follow the instructions here. The Amiga files have less bugs than the DOS ones, interestingly. That said, it makes me wonder: how far off are we from someone getting DOSBox going on the Switch—and might a lot of those older games end up getting ported over?